Jordan Peele may well be the best horror director of the decade, and at the start of it you would never have guessed. He has a really particular feel for the genre, understanding both the importance and the technique of mood, tension, imagery, and performance that has made classics. Get Out was an amazing debut, masking sharp racial satire and cogent social commentary in layers of harrowing suspense and mystique, and though Us doesn’t top Peele’s Oscar-winning predecessor, it’s probably the best American horror film to come out since. After a traumatic experience as a child at a Santa Cruz Hall of Mirrors, Adelaide Wilson (Lupita Nyong’o) is returning to the area with her husband Gabe (Winston Duke) and their children Zora (Shahadi Wright Joseph) and Jason (Evan Alex), to spend the summer at their new beach house. But at night, four strangers show up and attack, revealed to be sinister doppelgängers of the family armed with scissors. The Wilsons are forced to fend for their lives as the nature of their doubles gradually becomes more horribly apparent. This plot is of course dotted with echoes of movies like Invasion of the Body Snatchers, but according to Peele, the primary inspiration was the “Mirror Image” episode of The Twilight Zone, about a woman who’s haunted by her doppelgänger. Simple, and yet it’s an idea that hasn’t really been revisited much. It’s one of those concepts you don’t realize until something like Us comes along is actually really scary and kind of brilliant. Have you ever looked into a mirror and imagined your reflection changing, perhaps giving off an unsettling expression? It’s a bone-chilling little bit of paranoia that Peele recognizes. The idea that facsimiles of ourselves can be our own worst fears is absolutely fascinating andUs extrapolates on it to weird and quite terrifying ends. Where Get Out was a relatively slow build, Us gets into the terror more quickly, and Peele executes his scares with tact and aplomb, manipulating tracking shots and lighting, holding on moments uncomfortably, and using suggestion in smart ways. There’s a sequence where each of the family members is separated by their doubles, though in the same vicinity; and when focussing on one, another can still be heard in their own fear or agony just outside our periphery of the scene. It’s a clever way of keeping the momentum when cutting between individuals. Some of the best stuff though, is the imagery. The production design on a couple locations, notably in the third act, is exceptionally spooky. And the way particular moments are framed have a really eerie, nightmarish quality to them. Such as one early shot of a girl in an already creepy environment staring at the back of her own head, as well as a follow-up where said doubles’ face is mostly obscured in darkness, save for her eyes, mouth, and the outline of her body. Later in the movie in what has to be a conscious homage to Persona (the pinnacle of movies about duality), a character is presented in a haunting out-of-focus close-up having a conversation with their twin in the background. And in the climax, the editing is remarkable, match-cutting flawlessly and likewise making for a desperately compelling and frightening sequence. These smart and stylish filmmaking choices are abetted by an amazing score by Michael Abels that recalls among others, Wendy Carlos’ work on The Shining. The explanations and the implications are perhaps the greatest horrors ofUs though. Like Peele’s great influence, The Twilight Zone, the film is speculative and just a little nihilistic. It’s also heavily laced with commentary (consider why it’s called Us rather than “Them”) reaching far beyond simply the family at the centre of the story. And Peele is nothing if not meticulous. Just like in Get Out, he demands you pay attention even to small things, and right from the beginning throws up a couple clues to the bizarre mystery he’s unravelling -just enough to prompt your imagination to fill in the blanks with whatever it sees fit until the truth comes out. Yet Peele’s script also contains a good degree of his trademark humour, some dark in nature, but also some that’s just relatable and charming, not to mention very clever. It endears the family to you in a way many horror movies forget to. But Us is a movie that succeeds or fails on its cast, required as they are to each play two roles. Luckily, Lupita Nyong’o is an incredible actress more than up to the task of her immensely challenging job, Winston Duke proves himself remarkably in both humour and action, and the kids are quite adept themselves, especially when playing the doppelgängers. Elisabeth Moss and Tim Heidecker play the Wilsons’ friends in pretty good comic relief parts. Nyong’o though is by far the most impressive. As the double (called “Red”) she’s properly scary and unpredictable, while as Adelaide, she’s resilient, resourceful, though psychologically damaged, and plays both parts with intense believability and the utmost passion. There’s a lot more to Us that I can’t discuss here; elements and ideas to mull over long after the movies’ ending. And it is the kind of movie that prompts you to watch twice, if not for the new details illuminated by knowing where it’s going than for the numerous subtleties to subgenres and specific films. 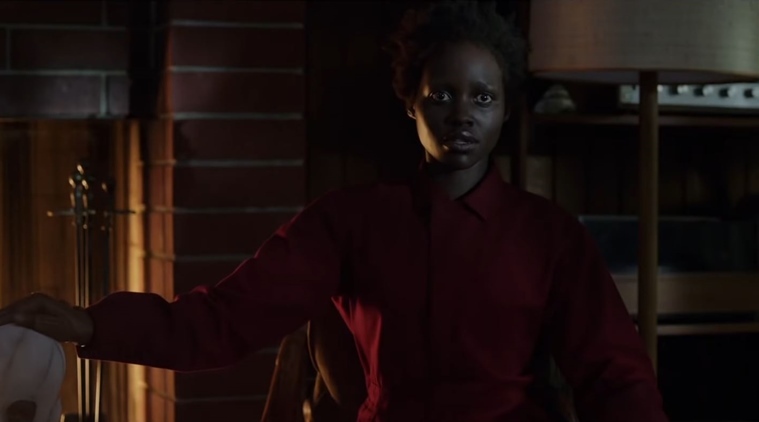 Jordan Peele has once more taken his love of the breadth of horror fiction and channelled it into something new and captivating; and in so doing has perhaps firmly laid a claim to the mantle of Hitchcock and Carpenter as a modern Master of Horror.